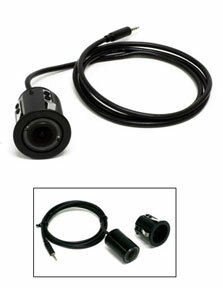 Marshall Electronics Optical Division - 1/4" CMOS Rear View Camera for the automobile, industrial video, covert security, and surveillance markets. High resolution color vehicle camera. Weatherproof IP67 durable metal housing. 155° horizontal wide field of view. Day / night auto switching with IR LED illumination. Cost effective camera for rear, forward, any view on vehicles. DC 12V power input from vehicle power outlet. The Marshall high resolution with night vision rear view camera provides 155° horizontal wide field of view. Day / night auto switching with IR LED illumination. Durable weather proof IP67 metal housing for front or rear of car, SUV, truck or other vehicles. Easy DC 12V power input from vehicle power outlet. Determine convenient vehicle location for installation, prepare 31mm diameter mounting hole, insert cable, camera / 30mm spring clip mount holder, (secure two mount holder set screws to camera housing, see / follow included User Manual), connect power, video monitor (not included) and experience high resolution wide field of view imaging. Great cost effective camera for rear, forward, any view on vehicles not equipped with camera options. IR Night Vision IR LED with day / night auto switching.